BoxLib implements parallelization through a hybrid MPI+OpenMP approach. At the coarsest level, BoxLib decomposes the problem domain into rectangular boxes, and distributes these among MPI processes. Each process follows an "owner computes" model, wherein it loops over its own boxes, executing Fortran kernels on each box in series. An example is shown in the figure below, where the red and green boxes are assigned to the same MPI process. BoxLib adds an additional layer of parallelism within each MPI process through OpenMP threading, specifically by decomposing its set of boxes into a set of smaller "tiles", which are then distributed among OpenMP threads. Although these tiles can be arbitrarily shaped, by default they are pencil-shaped, being long in the stride-1 memory access dimension (the x-dimension in Fortran kernels), and short in the other two dimensions, in order to attain high cache reuse and optimal hardware memory prefetching. As with the MPI parallelism, the OpenMP tile box parallelism also follows an "owner computes" model, but at the finer-grained thread level, rather than at the process level. This OpenMP parallelism is illustrated in the figure below. 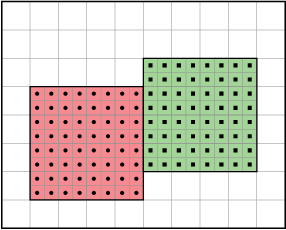 The box distribution is the same as in the figure above, except in this case each box is further decomposed into smaller tiles. BoxLib then builds a list of all tiles comprising all boxes owned by a given MPI process, and distributes the list among the OpenMP threads in the process. 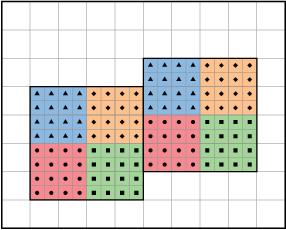 The figure below illustrates this process by color-coding each tile, with unique threads assigned to each color, such that the same thread may operate on tiles spanning different boxes. This approach avoids unnecessary thread synchronization which would occur if threads were distributed among tiles within each box. The figures on this page are taken from the AMReX User's Guide.